Pineapple sheera! Yum! One of my most favourite sweet dishes. 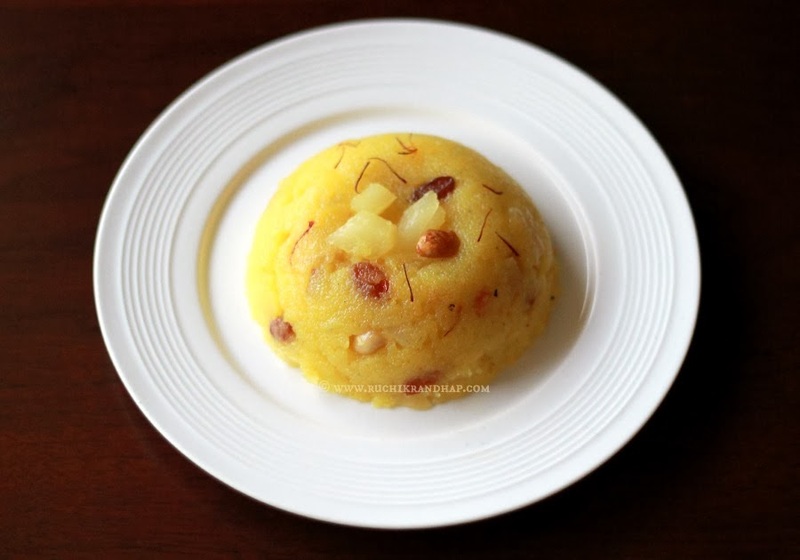 Well, I have posted the recipe for sheera twice already but I was simply compelled to write another recipe again, adding pineapple chunks this time. Sheera is something I remember eating as a child at some happy and not so happy occasions. The plain sheera was made very often at my place. I totally loved my mum’s version – a not very sweet version with a milky after taste. Maybe she used milk instead of water to cook it in. Sheera was usually made as a tea time snack. We came straight from school and what did we have? A steaming bowl of delicious sheera to dig into. It gave us enough nourishment to tackle the rest of the day’s problems – homework! A pile of which we lugged along on our poor backs along with backpacks that were the size of a mountain. These were the happy occasions (except for the homework) that I am talking about. Happy moments spent in the comfort of my home. The not so happy ones were when sheera was served as part of the sombre condolence meet after the third day, week or month’s Mind Mass (Mass offered for the repose/peace of the soul of the deceased a.k.a post funeral Mass). Sheera – heavy duty with ghee, raisins and nuts with bits of pineapple chunks was always such a delight to eat along with the potato or vegetable bonda, all washed down with strong coffee or tea that didn’t taste very sweet after having the sugar loaded sheera.I was just having a chat with my reader Anita who says that these days Mangies have become stingy. They just serve upma, vada and chase the people away. Lol! Hilarious! Gone are the days of upma, sheera, meat puff & potato bonda eh, Anita? 1. Heat ghee in a wide based pan/kadhai and toss in the cashew nuts and fry them on a low heat till they then turn light golden. Remove. Next, fry the raisins till they just puff up, remove immediately before they burn. If using, soak the saffron strands in the warm milk for at least 10 minutes or till the milk has changed to a bright yellow. 2. In the same ghee add the semolina and roast on a low heat for 2- 3 minutes taking care to see that it doesn’t burn. If you fry the semolina on a low heat it will get partially cooked and help fluff up quickly. While the semolina is frying, bring the 2 cups of water and 1 cup of milk to a boil. 3. When the semolina has roasted and gives out a nice aroma add the boiling milk and water mixture to it. Be careful as the mixture can splutter! Add the sugar and stir. If you are using food colour or saffron add it now. 4. On a low heat keep stirring the mixture so that it doesn’t stick to the bottom of the pan and slowly the mixture comes together in a lump and the ghee starts to separate. The sheera is almost done. Add the roasted nuts and raisins, pineapple chunks and give it a good mix. Cover the pan and turn down the heat to very low. Allow to cook for 2 minutes. Remove from heat. 1. To make soft and mushy sheera the semolina : water ratio to be used is 1:3, you may use only water (3 cups) or 1 cup water and 2 cups milk if you like it a little rich. I prefer it light, so I used 2 cups water and 1 cup milk. 2. 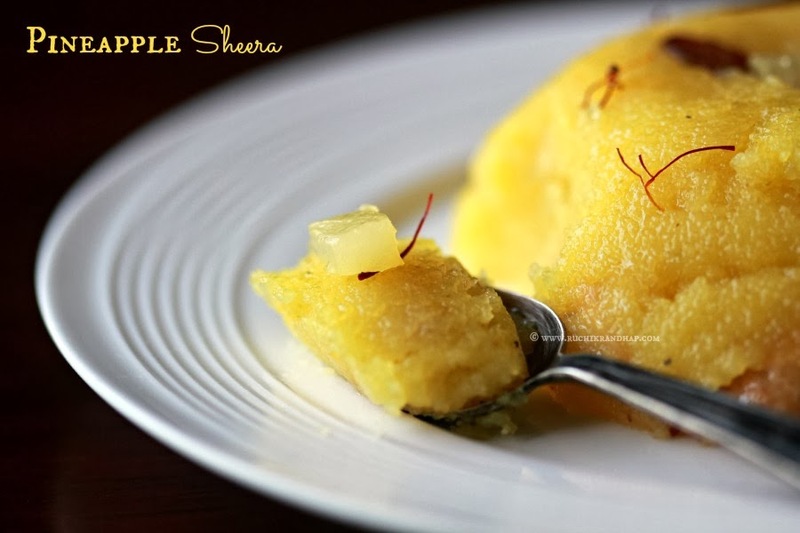 The best tasting sheera is usually made of a lot of ghee. Some recipes call for as much as 1 cup of ghee per cup of semolina! In my opinion it is too much and too rich. Since we count calories in our home we reduced it to a quarter of a cup. Use as much as you desire. Dil khush kar diya tumne. 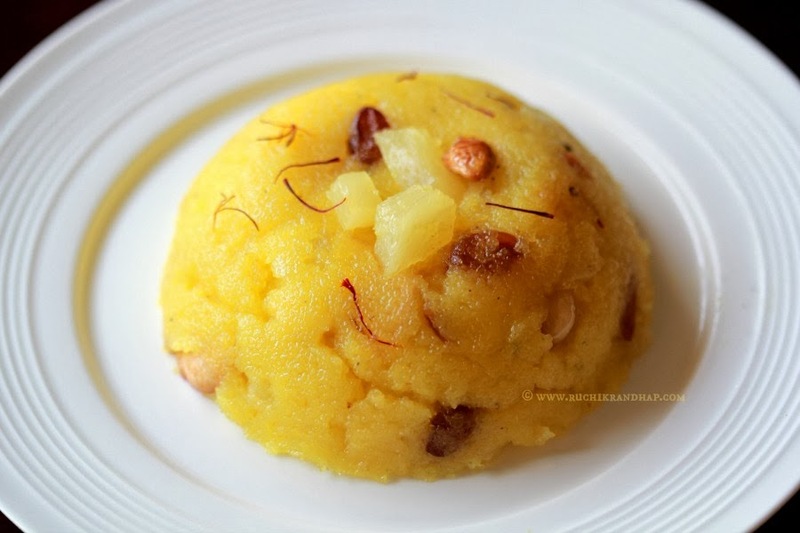 Excellent and delicious looking pineapple sheera. Hi Shireen, I'm an American in love with the flavors of India. Recently a friend gave me a large pan of Pineapple Sheera after a funeral and so much food to get rid of, I voluntered to take this lovely smelling Indian dish off her hands 🙂 Needless to say I fell in love with this wonderful dish. I heated it and served it with milk over it for breakfast and for a late night snack. Sadly it is all gone now so I finally did some research and looked it up, found out the name and how to make it. Today, after I found your recipe, I decided that today was the day and I checked my ingredients (have everything I need 🙂 So now off to the kitchen, wish me luck ! @ Razina, Usha & Deepa : Thanks so much my lovely girls!! @Terasinas: Thanks so much for your lovely comment, I am so glad you loved Sheera as it is my favourite too! I do hope you have been able to try my recipe and liked it too. It may feel very liquidy at one stage when you add the liquid (milk+water solution) but when you cook it on a slow heat it will thicken up and cook beautifully. Do feel free to reduce the ghee/clarified butter if you want it less greasy. Hope you like it! Nothing like remembering the good old days of Mangalore. The picture is too good to resist. The presentation was even better. Thank you for a nice recipe. @ Cecil D'Souza: Thanks so much for the lovely compliment! Happy New Year!